It isn’t often we associate dental work with comfort, but Dr. Lamberton’s office is pleased to be able to promise you virtually pain-free treatment with our new EPIC from Biolase – the latest advance in laser dentistry. EPIC is so innovative it won the industry’s gold medal for Dental Instruments, Equipment and Supplies in 2013. For more than 20 years, lasers have enabled dentists to provide state-of-the-art technology, with greater precision and less pain, to keep patients’ teeth and gums healthy. EPIC takes that technology into the future. Soft tissue surgery: EPIC gives us more precise control when cutting tissue or treating lesions – which translates to greater patient comfort. The tissue is cut cleaner and the work can be done faster and with less anesthetic. EPIC also allows us to perform more effective deep cleaning of your gums using single-use disposable perio tips, a Biolase innovation. Teeth whitening: EPIC is ideal for whitening teeth and brightening your smile. This new machine includes a proprietary Deep Tissue Handpiece that allows us to perform beautiful full-mouth, in-office whitening, four to six shades lighter, in only one hour of chair time – faster than any other method. Minor pain relief: If you suffer from pain-related conditions such as TMJ or other thermomandibular disorders, EPIC’s Deep Tissue Handpiece also allows us to precisely target the affected muscles, resulting in greater relief and more effective pain-control treatment. Cosmetic dentistry: If you want to improve your smile, laser dentistry can help. Our laser can be used in aesthetic gum contouring, and can also help manage gum tissue during impressions for crowns or veneers. If the fear of pain is discouraging you from seeking the dental treatment you need or want, you no longer need to worry. You can be assured of maximum comfort with our office’s new EPIC laser. 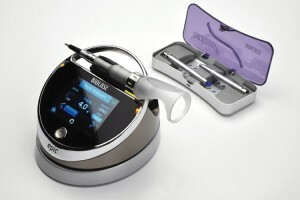 Call us at 707-257-7771 for more information on how the EPIC laser can benefit you.